Gaps between media segments that are smaller than the audio frame size are allowed and should not cause playback to stall. Such gaps should not be reflected by buffered. 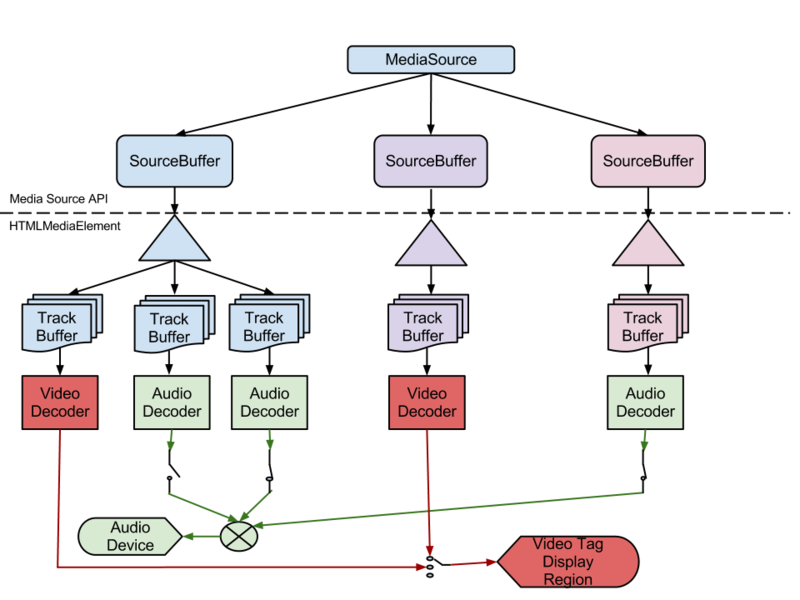 When an audio frame in the source buffer overlaps with the start of the new media segment special behavior is required. At a minimum implementations must support dropping the old audio frame that overlaps the start of the new segment and insert silence for the small gap that is created. Higher quality implementations may support crossfading or crosslapping between the overlapping audio frames. No matter which strategy is implemented, no gaps should be created in the ranges reported by buffered and playback must never stall at the overlap. Set the HTMLMediaElement.readyState attribute to HAVE_METADATA and fire the appropriate event for this transition. Set the HTMLMediaElement.readyState attribute to HAVE_ENOUGH_DATA and fire the appropriate event for this transition. Set the HTMLMediaElement.readyState attribute to HAVE_FUTURE_DATA and fire the appropriate event for this transition. Set the HTMLMediaElement.readyState attribute to HAVE_CURRENT_DATA and fire the appropriate event for this transition. Note: This preserves audio frames that start before and end after the duration. The user agent must end playback at duration even if the audio frame extends beyond this time. Let media source be the MediaSource object that created this object. If this object has been removed from the sourceBuffers attribute of media source then throw an INVALID_STATE_ERR exception and abort these steps. If the readyState attribute of media source is in the "closed" state then throw an INVALID_STATE_ERR exception and abort these steps. Set the readyState attribute of media source to "open"
queue a task to fire a simple event named sourceopen at media source . If data contains anything that violates the byte stream format specifications, then call endOfStream("decode"), and abort these steps. If any of the modified timestamps are earlier than the presentation start time, then call endOfStream("decode"), and abort these steps. The createObjectURL(mediaSource) method must run the following steps. Note: This algorithm is intended to mirror the behavior of the File API createObjectURL() method with autoRevoke set to true.